Rear Admiral Colin Chinn is the Joint Staff Surgeon at the Pentagon, Washington, D.C. He serves as the chief medical advisor to the Chairman of the Joint Chiefs of Staff, providing advice to the Chairman, the Joint Staff, and the Combatant Commanders. He coordinates all issues related to Health Services to include operational medicine, force health protection, and readiness among the Combatant Commands, the Office of the Secretary of Defense, and the Services. 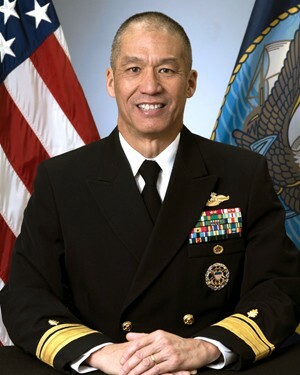 A native of San Francisco, Rear Adm. Chinn graduated from Johns Hopkins University in 1979 with a bachelor’s degree in public health and received a master’s degree in epidemiology from Johns Hopkins University School of Public Health in 1982. After his commissioning as an ensign in 1981, he attended the Medical College of Virginia through the Armed Forces Health Professions Scholarship Program and earned a Doctor of Medicine in 1985. He completed an internal medicine internship and residency at Naval Hospital Oakland, serving as chief medical resident in 1990. Chinn completed gastroenterology fellowship training at Naval Medical Center San Diego in 1993. Since completing his medical training, Chinn has served his country both domestically and overseas in a number of roles, including as director of TRICARE Region West/Pacific, chief of the Navy Medical Corps, United States Pacific Command surgeon, and as the dual-hatted Director of the Research & Development Directorate (J9) of the Defense Health Agency and U.S. Army Medical Research and Materiel Command (USAMRMC) Deputy Commander. His most recent assignment was as the Acting Deputy Director of the Defense Health Agency. His accomplished career as a doctor and leader with the U.S. Navy makes him a vital asset as he strives to help the Military Health System deliver an integrated system of readiness and health. Chinn is a Fleet Marine Force qualified officer. His personal decorations include the Defense Superior Service Medal (three awards), Legion of Merit (three awards), Meritorious Service Medal (three awards), Navy and Marine Corps Commendation Medal (three awards), Navy and Marine Corps Achievement Medal and various unit and service awards. Combat & Casualty Care spoke recently with the Joint Staff Surgeon and Medical Advisor to the Joint Chiefs RADM Colin Chinn regarding current focus on a smooth transition of Defense Health Agency oversight of all Military Health System function in support of greater effectiveness in cross-Service healthcare needs. C&CC: Please speak to your role as Joint Staff Surgeon and what your current priorities are in support of the Joint Force. RADM Chinn: My role as the Joint Staff Surgeon is to serve as the senior medical advisor to the Chairman of the Joint Chiefs of Staff. Among many things, my primary responsibility to the Chairman is to ensure that health services are globally integrated in support of enabling joint force operations. My staff and I do this through overseeing medical requirements and capabilities, as well as education, evaluations, and assessments. Additionally, we (along with our stakeholders across the DoD) ensure that the Military Health System (MHS) is synchronized across the Services and combat support agencies to support Combatant Command requirements. C&CC: We’ve recently become aware of the Chairman’s (Chairman of the Joint Chiefs of Staff) responsibilities as they relate to globally integrating the Joint Force. How are you applying this concept from a joint medical perspective? RADM Chinn: The speed and complexity of modern warfare demands a different approach (than that of years past) to meet Combatant Command requirements involving all military domains cutting across multiple geographic regions. Global Integration describes the Chairman’s authority to respond to these global requirements using military options. The Chairman, by law, serves as the integrator for the entire Joint Force, by extension, The Joint Staff Surgeon has a responsibility to globally integrate the Joint Medical Force. Through Global Force Management, the Joint Staff meets daily requirements around the world maintaining readiness and flexibility to respond to the unexpected. In essence, as the Medical Global Integrator, I ensure the Joint Force is resourced and operationally aligned to meet strategic priorities and integrated globally with medical sustainment capabilities. My office reviews plans, contributes to estimates, and participates in discussions across Combatant Commands to communicate medical integration requirements globally. In an era of constrained resources, I also have to be prepared to make hard recommendations to change global medical positioning of capabilities to meet emerging threats. Therein lies the heart of the matter. What occurs in one theater may have an impact in other theaters and we the Joint Staff, need to ensure that we have done everything in our power to account for that in our planning. It’s about being prepared for the unexpected. Finally, while we are focused on Combatant Command’s executing theater plans, my staff and I work with the Services and the Defense Health Agency (DHA) to provide focused medical capabilities tailored to meet healthcare challenges in contingency operations across all Combatant Command areas of responsibility. C&CC: In terms of the challenges unique to producing and maintaining medical readiness in today’s military, what are some priorities you are focusing on? RADM Chinn: As the Joint Staff Surgeon, my highest priority is ensuring the Joint Medical Force remains highly proficient and effective in supporting the lethality of the operating force across all domains. Medical skills proficiency, joint operational capability and capacity, and interoperability are among the top challenges to integrate across the Joint Force. Each Service has unique requirements that are essential for Joint Force execution and effectiveness across the Range of Military Operations. However, there is a core set of medical capabilities that transcend Service requirements. We continue to identify and refine Joint Knowledge, Skills and Attributes (KSAs) to address common gaps in clinical/surgical skillsets across the services in an effort to improve operational proficiency and interoperability. Additionally, addressing equipment standardization and interoperability poses a significant challenge, related to, but separate from, the KSAs but also impact readiness. Using technology to develop systems to build and monitor readiness assist in understanding a common operating picture and assists in defining a modular, expeditionary medical force that can be employed across a variety of operational domains. All of this must be worked within a resource-constrained (both personnel and financial) environment. Finally, I seek to be the honest broker in addressing the Combatant Commands’ unique requirements to the Services and DHA, ensuring that the operational readiness needs are met and DHA is able to deliver within its Combat Support Agency role. Meeting readiness goals is no small challenge while simultaneously executing health system reforms and changes being addressed by the Services and DHA. The Joint Staff stands at the ready to meet these challenges with our key and valued stakeholders. C&CC: Could you expand on the intent for developing a Joint Medical Estimate? What are the main outcomes associated with this? How will you measure progress? RADM Chinn: My vision is a medical enterprise capable of supporting a military conflict continuum at the speed of war – from the tip of the spear, through theater hospitalization and patient movement back to military treatment facilities providing definitive care. The Joint Medical Estimate (JME) provides a framework to assess key medical capabilities in support of joint operations and is similar to how the J1 uses its Joint Personnel Estimate or the J2 uses its Joint Intelligence Estimate to assess their communities, respectively. The assessment includes capabilities such as: medical force generation, environmental medicine, medical logistics, Global Health Engagement (GHE), patient management, patient movement, forward resuscitative care, hospitalization, definitive care and medical countermeasures. The JME is directed by Congress in the National Defense Authorization Act (NDAA) 2019 and drives dynamic innovation that rapidly builds, projects, and sustains life-saving and life-sustaining capabilities for the joint force. This allows targeted investments in capabilities in line with future warfighter formations across ground, air, sea, cyber and space domains. C&CC: With Military Health System reform on the forefront and in full swing, how is your office involved in this effort? What are your equities in support of reform? Do you have any concerns? RADM Chinn: As the Chairman’s senior medical advisor, my primary responsibility is to ensure that the Joint Warfighting force has what it needs to execute their Globally Integrated Campaign Plans, from a medical perspective. With that in mind, my office is strategically engaged with our partners within the Military Health System (MHS) to ensure that the Chairman’s equities are not being compromised and that the end state remains support to the Joint Warfighter. I firmly believe that if we keep this end state at the forefront of every discussion and every decision, reform will have positive outcomes for all parties involved. In the military, there is this concept of supporting and supported commands or organizations. My view is that the deployed Soldier, Marine, Sailor, and Airman on the ground, at sea, or in the air is the supported entity. At the end of the day, MHS reform must conform to this very basic principle. If we can focus on this, everything else will fall into place. This is an excellent opportunity to take advantage of the economic principle of division of labor. With the DHA assuming authorities, direction, and control of all Military Treatment Facilities (MTFs), as well as lead for Combat Support areas that support all Services, this will free up ready medical forces in the Army, Marine Corps, Navy, and Air Force to do what they do best—sustaining their line counterparts in fighting battles and winning wars. C&CC: As global health engagements grow in importance with the interconnected sharing of worldwide health research outcomes, what are some of your priorities for boosting alliances with partnering national medical entities? RADM Chinn: Global health engagements help to build military medical interoperability while fostering current partnerships, attracting new DoD partners, and is a strategic enabler for the Combatant Commander. Health engagements also contribute to the readiness of our own Joint Force. Integrating global health engagement within The Chairman’s global integration priorities is crucial for attaining security cooperation objectives. Diseases know no boundaries and ensuring health as a means of security is vital for both the United States and our partner nations. A prime example of fostering military medicine interoperability is supporting multilateral military medical platforms with our NATO partners. Furthermore, global health engagement facilitates achieving capacity building with partner nations with a shared goal of bi-lateral security cooperation. Such engagements range from health systems strengthening, research, and disaster response, all which provide sustainment, learning opportunities, and readiness training for DoD personnel. Research, for example, promotes partner nation interoperability with such tools as epidemiological surveillance for infectious diseases which directly contributes to force health protection both for DoD service members and our partner militaries. C&CC: In terms of the Chairman’s focus areas, what are your thoughts on developing the next generation of joint medical leaders? Where should the services focus their professional development efforts? RADM Chinn: It starts with acknowledging that we (medical) probably have not done as good a job at this, when compared to our line counterparts. Do not get me wrong, we have produced excellent leaders throughout the years, but the focus has been primarily on growing and developing medical leaders who understand and know how to run a healthcare system, not necessarily a military organization that happens to provide healthcare. This has to change if the Services expect to have medical leaders capable of producing and managing ready medical forces whose primary focus and duty is to support Combatant Command requirements. To be certain, we will need leaders who have experience and have excelled in both the operational and healthcare delivery arenas. The DHA has and will continue to have uniformed medical personnel requirements to fulfill its mission. This will require innovative approaches to balance Joint Professional Military Education (JPME), along with the clinical and administrative management KSAs that many of our specialties will require long term. It also involves proactive talent management through the development of a human capital strategy for medical leaders. It is imperative that we identify capable leaders early and design professional development and career assignment pipelines aimed at not only developing specialists, but also leaders who are capable of managing ready medical forces in a joint environment. O6 or O5 command should not be the first time we’ve assessed whether or not an individual is cut out for these types of roles, where authority, responsibility, and accountability is at its peak. C&CC: Please feel free to address other goals and challenges moving forward. RADM Chinn: As discussed, reform within the MHS is providing us opportunities that have not existed in the past. Having spent time as a Combatant Command Surgeon, as well as multiple assignments with the U.S. Marine Corps—I am convinced that the more closely integrated a medical department is with the line, the more attuned we are to the needs of the Warfighter and the better we can define and communicate medical resource and capability development requirements to program sponsors at the Pentagon and our leaders in Congress. Military medicine has achieved amazing results with respect to survivability rates in combat over the past 17 years due to well-documented advantages over our adversaries in the Middle East. I believe that may not be the case moving forward and as a result, we must posture and integrate medical in a way that ensures we are completely aligned with the commander and his or her intent for sustaining the fighting force and preventing early culmination in pursuit of the objective (s). I believe this is an opportunity for each of the Services to conduct a thorough assessment of its medical department, how it is currently structured, resourced, and organized, and begin the process of developing models that best fit and are aligned with Warfighting priorities. Organized correctly, I believe military medicine can and will continue to deliver high-quality care in both the operational and healthcare delivery setting.